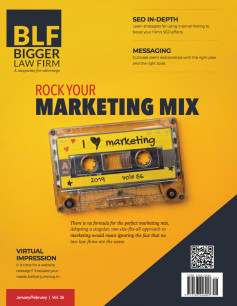 Bigger Law Firm Magazine is seeking attorneys and people working in legal tech and legal marketing. You could become a contributor to Bigger Law Firm Magazine. Since 2011, BLF has been a publication trusted by lawyers throughout the U.S. To maintain our reputation, we hold our contributors to high editorial standards. We predominately accept applications from experienced professionals that are actively working in the field they're writing about. For legal commentary, we do accept contributions from retired attorneys and public officials. All submitted news is unique for BLF and is not published anywhere else. Bigger Law Firm Magazine owns the copyright to your submitted content and may publish it on Biggerlawfirm.com and/or our bi-monthly print publication. Your content may be published indefinitely and you may not submit removal or change requests for published content. If selected, you have a lot to look forward to! Enjoy full access to all BLF content. Receive a free print subscription. You will be credited for all of your published work. You can promote your company or firm in your author bio. If your content is chosen for the print publication, you will be credited in the magazine and a full author bio will be published with your article.